Hardening your security configurations is job #1 in preventing breaches and detecting and correcting any subsequent changes that weaken them. Yet in complex corporate IT settings, it’s easy to understand how basic steps to security are overlooked. Especially when everything you are doing is a #1 priority. In a 2011 June report entitled “Perceptions About Network Security,” the Ponemon Institute found that 80 percent of the 583 IT security practitioners in the U.S. who responded to a survey said they had experienced at least one data breach. Of those who were able to calculate the cost of security breach — including cash outlays, internal labor, overhead, revenue losses, and other related expenses — 41 percent said the breach cost them $500,000 or more. What’s more, 53 percent of respondents to the Ponemon survey said they have little confidence that they would be able to avoid one or more cyber attacks in the next 12 months. If these companies haven’t focused on laying a sturdy foundation for their company’s security, they have good reason to worry. If you are getting serious about security fundamentals, i.e. hardening ever-changing IT configurations and keeping them that way, you would be interested in this quick guide on SCM. 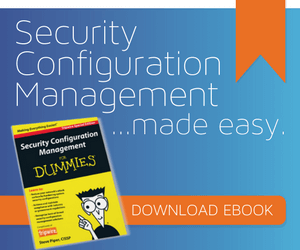 Download the SCM: The “Blocking and Tackling” of IT Security white paper here.